Is pay-per-view really the best way to go for web video site to monetize their site? I mean, earning some big dough from all the great videos upload to their site is Google’s biggest struggle with YouTube yet. Is Justin.tv, a famous video web site suffering the same fate as YouTube as they plan to make a pay-per-view model for their site? Beet.TV is reporting that Justin.tv will be testing out a pay-per-view service for selected premium video content. Justin.tv claims more than 35 million views per month, so the owners want to turn some of these views hopefully into cash, to perhaps help pay the bills. The pay-per-view platform is set to be rolled out next month with a projected full launch across its entire network sometime in Q2 of 2010. Under the new program, Justin.tv channel creators can start charging for their content, with Â Justin.tv managing user authentication and payment system. In return the site will get 30% Â of the payment. Minimum charge per paid view will be $1. Justin.tv has currently around 40,000 content creators streaming their programming lives daily. There are currently 1800 shows on Justin.tv and around 800,000 registered users. Will this give Justin.tv a much needed boost in the company’s financial forefront? Would content creators finally be able to earn significant revenue from their video content? Answers to this question will definitely depend on how much users are willing to spend to get their daily dose of user-generated video content. Â Pay-per-view user generated content is still somewhat an untested water, so Justin.tv should ensure that their premium contents really have value. Interactive media and technology startup DailyMe.com has launched, a user-centric news destination that offers top-quality content and advanced features as well as three distinct editions: personalized, community driven and editor selected. The new destination builds on DailyMeâ€™s core strengths of robust content â€“ both licensed and user-generated â€“ and advanced delivery options, which include web views, RSS, email and automated printing. DailyMeâ€™s three editions allow users to select the news they wish to receive based on the level of personalization they seek. The Weather Channel today launched its Help Make Every Day Earth Day initiative. The campaign encourages green enthusiasts to answer the question â€œWhat are you doing to help save the planet?â€ via user-generated content including photos, text and 30-second videos. The Weather Channel will showcase select user-generated entries that express ideas and solutions about helping the environment on-air and online. 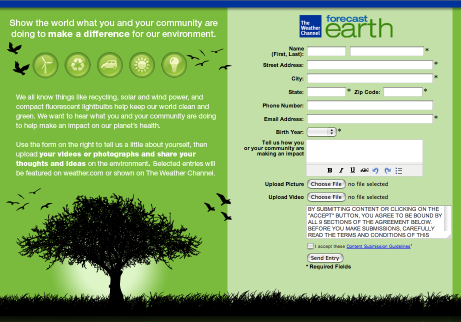 Participants can upload their material to an entry page at weather.com/forecastearth, or theweatherchannelkids.com. Adults and children aged 13 and older are eligible to submit content. The Weather Channel will begin running selected user-generated â€œgreen-ettesâ€ in March on the network as well as online, and increase their frequency leading up to Earth Day on April 22. KickApps announced the release of version 3.0 of its SaaS application suite. This version makes it easier for web publishers and developers of all levels and experience to deploy Social Networking, User Generated Content (UGC), Programmable Video Players and Widgets. In addition, the new release extends a web publisherâ€™s ability to manage media, members and reportingâ€” essential elements to growing a successful online community. KickApps 3.0 opens community creation to a wide range of non-technical web publishers. A powerful new WYSIWYG site creation and deployment interface allows web publishers with minimal technical knowledge the ability to build and customize social media websites and widgets with just a few clicks. These point-and-click features also help experienced web developers achieve rapid prototyping and fast deployment. KickApps 3.0 also includes an array of community experiences that focus on driving member engagement and viral growth: community news feeds, social graphs, one-click media syndication, media-enabled message boards and customized group features. One of the most powerful enhancements is the KickApps 3.0 Affiliate Center. The KickApps Affiliate Center is where web developers deploy, customize, manage, monetize and moderate their online communities. Version 3.0 transforms the KickApps Affiliate Center into a dynamic control panel that provides real-time data essential to growing audience and engagement. The KickApps Advertising Manager in the Affiliate Center enables ad insertion from all major ad networks for optimal monetization. Hubdub is introducing a new technology platform and community that combines the value of user-generated news aggregation with the accuracy and excitement of prediction markets. Unlike Digg or Reddit, Hubdub tracks only the stories that people decide are worth creating a market around. To create a market, someone simply asks a question, for example, â€œWill Barack Obama secure the Democratic Presidential nomination?â€ They request either a â€œyesâ€ or â€œnoâ€ answer or offer a multiple choice scenario, then determine the duration of trading. Other community members can wager â€œHubdub dollarsâ€ (H$) to compete on predictions â€“ everyone starts with H$1,000. As market creators and predictors build a successful portfolio, they can establish credibility to leverage within their industry or area of expertise. Successful predictors make the leaderboard in topics such as Technology, Politics and Sports, which they can link back to their blogs, sites or profiles on social networks. Markets allow people to see how opinion on any question evolves and changes over time, similar to the historical views on favorite financial trading sites. For each market, Hubdub automatically populates the trading page with aggregated news from across the Web to provide background and insight for predictors and bystanders. Depending on activity, the market, representing opinion, will trade up or down. At the very least, Hubdub helps people discover, track and discuss all major news stories and offers to challenge, excite, and reward them through competitive prediction of story outcomes. It also promotes and facilitates intelligent user comments and intense debates. In addition, markets can be embedded in blogs, allowing bloggers to highlight news stories, issues and outcomes they care about within their own communities.